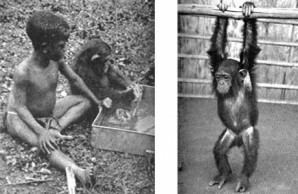 Left: Washing: Captive chimpanzees like playing in water, washing their hands, feet, or other convenient objects. Meshie will stamp in the water for the joy of seeing it splash; right: Swinging from a pole. Chimpanzees have long hands and fingers which afford a much surer grip on a branch than the shorter and proportionately weaker hands and fingers of man. During the last days of my stay in Cameroun and for ten days after embarking, I was unable to care for Meshie myself, but at Kribi, before sailing, a supply of tinned milk had been secured for her, as well as some fruit; I persuaded the ship’s steward to feed her, and Captain Philips kindly put at her disposal a cage in which he had kept a chimpanzee on a previous voyage. During this time Meshie, too, became ill, and when I was able to get about I saw that she was very sick. I dosed her and in a short time she began to pick up, but it was many days before she would take any food but milk and orange juice in small quantities. She had always been fond of bananas but now she refused them as well as all other solid food. Eventually she began to eat again, stewed fruits such as peaches, pears, and apricots being the first solid food she ate. From where I kept her on the upper deck of the steamer, she could see a large locker that had been filled with bananas at one the ports, as food for eighty-five monkeys destined for Yale University. Everytime Meshie got loose while recuperating, although she refused the bananas I offered her, she made for the locker, chose a green banana, peeled it and ate the puckery inner portion of the skin but would not eat the fruit itself. This behavior continued until near the end of the six weeks’ voyage, when she was again quite well and would eat ripe bananas but not the inner skin unless she were especially hungry. Sometimes she was tethered on the hatch amidships and there she had a little cup. When, as frequently happened, one of the ship’s officers would come on deck with a cup of tea or coffee, Meshie would put out her hand and beg for some or go and get her cup and hold it out. This of course always won her a drink. During the latter part of the voyage the weather suddenly turned cold. It was necessary to put the six or eight large cages containing several species of West African monkeys and some baboons down in a hold. Meshie was also put down there though she resented it. By this time she had succeeded in breaking the wire of her cage, but she was chained to it so that she was free to go in or out. The cages containing the monkeys were boxes six feet long by approximately half that in width and height and they were piled two deep. It was almost dark down there. The next time I went down two of the cages were upset and monkeys were everywhere. Meshie, though barely able to reach the cages, had pulled two of them down and then removed the cord and stick from the staple, opened the trap door, and allowed the monkeys to escape. Fortunately only a few had escaped to the deck and the rest were running around in the hold. With a flashlight I looked in Meshie’s cage, for she had not come out as usual when I called her. She sat crouched in the corner and looked up pitifully. Then I saw she was holding a baby monkey in her lap. I scolded her and called her to come out. She came, walking on her hind feet and holding the baby against her body. I was surprised to see what appeared to be mother instinct so far developed in a baby chimpanzee. She carried this half- grown baby monkey a whole day before it was put back with the others. Long before I sailed from Africa, while still in the interior of the Cameroun, Meshie sat beside me during meals at my little table in camp, and when I had nearly finished my soup, I would hand her the spoon but would not let her put her mouth down to the plate. She learned immediately that she was to bring the food to her mouth with the spoon. I would leave a little food for her in my plate after each course during the meal. When hungry, she would eat most of the kinds of food that I had, occasionally some meat, though she was not very fond of this. We had soup made of peanuts or calladium nearly every day. Then there were such vegetables as green beans, sweet potatoes, plantains, green papayas, cassava and cassava leaves, and occasionally others. Of fruits she preferred mangoes to all others available there. The only fruit offered her in the Cameroun which she seemed to dislike was the avocado pear, lately introduced and now widely distributed there.